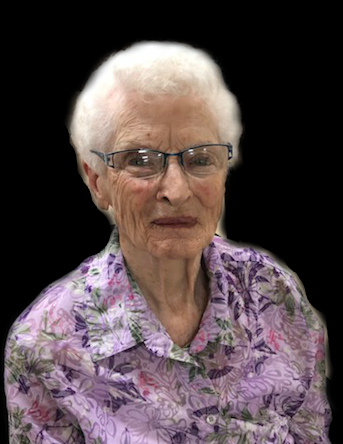 It is with heavy hearts that her family announces her passing at Extendicare Timmins on Monday, March 18th, 2019 at the age of 95. Clémence was the daughter of the late Cleophas and Cordelia (nee Ethier) Génier. Predeceased by her husband Clarence Wilson (1994). She leaves in mourning her son Clifford (Joanne) Wilson of Cochrane, her grandchildren: Debbie (Sylvie), Alanna (Waylon), Darren (Carrie), Lisa (Serge), her great-grandchildren: Blaire, Rhys, Scott, Rachel, Erin, Harrison, Georgia, Dylan, Marin, Zach and Damia. Clémence also leaves behind her siblings: the late Alma (the late Tony) Castonguay, the late Bernard Génier, the late Jeannine (the late André) Bérubé, the late Annette Morin, the late Huguette (the late Don) Labelle, Stella (Joe) Mason, the late Wilfred (Dorothy) Génier, Florian (Claudia) Génier, the late Aline Huard, the late Albert Génier, the late Alain Génier, numerous nieces and nephews and friends. Mrs. Wilson was active in the C.W.L. of St-Patrick’s & Christ the King prayer group in Sudbury, a regular volunteer in the cancer center and also loved to travel. The family will receive friends on Thursday, March 21st, 2019 from 2 pm to 4pm and 7pm to 9pm & also on Frirday, March 22nd, 2019 from 9:30 am to 10:30 am at the Maison Funéraire Génier Gauthier Funeral Home, 70 Seventh Ave. South, Cochrane. The funeral mass will be held on Friday, March 22nd, 2019 at 11am at the Transfiguration Church of Cochrane with Father Richard Fortin officiating. A reception will follow at the church Hall.